It’s one of the region’s biggest and best-established road runs – with over two decades of history. 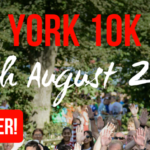 With a fantastic – and fast – course, a truly spectacular finish, super support all around the route and a great goody bag with its renowned race bling, it’s no surprise the City of Lincoln 10K is a must-do event for thousands. Our first event of the 2019 season, it’s also a great warm-up for the London Marathon or a Spring half. It boasts a route that takes in some of Lincoln’s historic landmarks, including the cathedral and the city’s Roman Walls. Run for fun, for charity or for a personal best on this fun, flat and fast course.